Pick and place errors account for the majority of quality issues when programming small devices. Pick and place inaccuracy occurs when the machine is not taught precisely. Teaching the machine manually is nearly impossible for small devices, and for larger devices operator skill and experience are required. Programming centers and manufacturers programming small devices incur added costs for labor, machine idle time, lost devices, damaged devices, escapes, and poor yield. 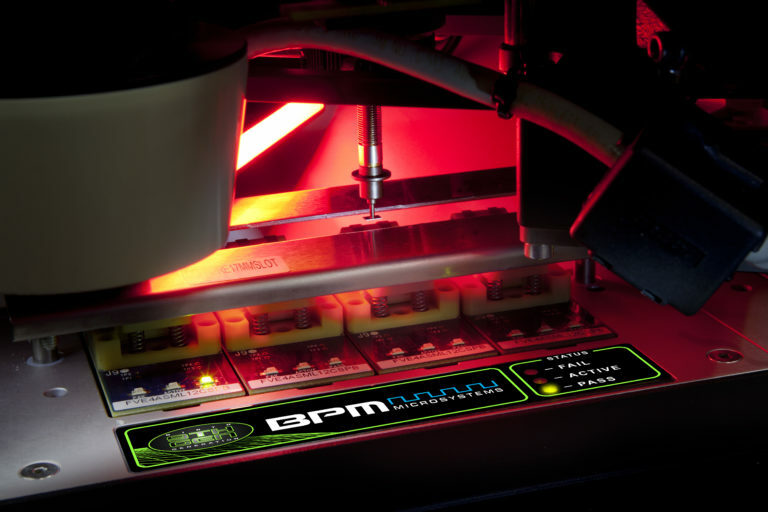 BPM invented WhisperTeach™, patent pending, to help programming centers and manufacturers reduce setup time per job, improve cycle time, reduce changeover time, and improve job accuracy. WhisperTeach™ uses artificial intelligence and an enhanced pneumatic system to learn and determine the accurate z-height between the nozzle and device. Companies report manual teaching small devices takes up to 30 minutes per station. For programming centers with five changeovers per day, this costs 2.5 hours machine idle time and labor costs. With WhisperTeach™, the operator initiates WhisperTeach™ within the BPWin™ process control software during the normal job setup workflow. WhisperTeach™ completes the task in 4.37 minutes with a standard deviation 0.5mils, resulting in a savings of 2.14 hours per day. Accurately taught jobs improve yield by eliminating pick or place errors. Companies have reported yields as poor as 80% on very small parts using manual teach depending on operator skill. WhisperTeach™ produces a job yield of 99.99% by eliminating any teach related issues. WhisperTeach™ supports a wide range of device sizes. WhisperTeach™ is now available on the 3910, 4900 and 4910 automated programming systems.